If you're on our Free or Plus plans, you'll need to upgrade your plan to be able to see your Best Time to Post! Head to our Pricing page to check out the plans we have to choose from. 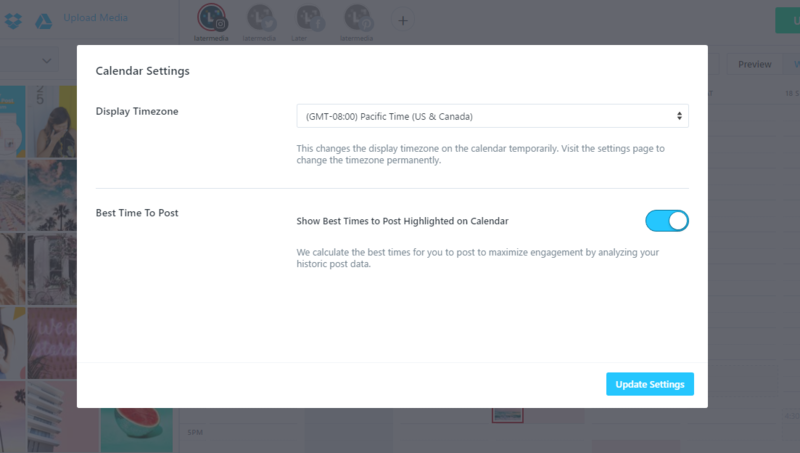 Best Time to Post looks at the engagement of your actual Instagram posts, so that the data that we give you -- in the form of time slots on your calendar -- are as personalized as possible! Because of this, you need to only select a single Instagram profile to be able to get your Best Time to Post. You have the option to toggle Best Time to Post on or off for each browser -- so make sure it's not set to "off"! Click on the gear icon above your calendar, and make sure it's turned on. Best Time to Post needs enough data to generate your report! We need to have 50 posts in the last 6 months, and since they're still getting likes and comments, posts less than 2 weeks old don't count yet. If this is the case, keep posting -- once you hit 50 posts in that window, you'll see your Best Time to Post appear! This is a great opportunity to try new times and days to post, so that we have as much data as possible to find your best time slots. If everything looks good, and you have enough posts, but you're still not seeing it, drop us a line at hello@later.com, and we'll work together to figure it out!